Assassin's Creed is an action adventure video game created by ubisoft. It supports most of the game stations like xbox one, xbox360. the offer applies only for xbox one console. check here about how to install a Game in Xbox one console. This game is very interresting who loves thriller and adventure. It creates a real time advernture fro you inside in your mind. Hope you will enjoy this game.. Final Price is $11.98Note: Amazon.com changes price frequently so deal may expire at any time. Please refer to post time to see when deal was posted. The Assassin's Creed games primarily revolve around the rivalry between two ancient secret societies: the Assassins and the Knights Templar, and their indirect relation to an ancient species pre-dating humanity, whose society, along with much of Earth's biosphere, was destroyed by a massive solar storm. 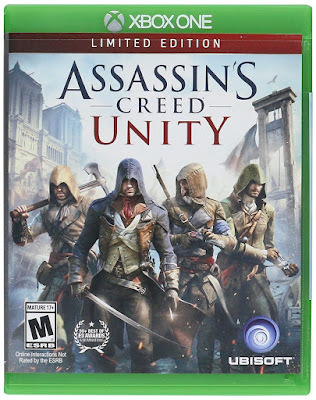 The games' real-world chronological setting begins in the year 2012, and features Desmond Miles, a bartender who is a descendant of several lines of prominent Assassins; though raised as an Assassin, he left his nomadic family to seek out a more common lifestyle. He is initially kidnapped by the megacorporation Abstergo Industries, the modern-day face of the Knights Templar, who are aware of Desmond's ancestral lineage. Desmond is forced to use the "Animus", a device that allows him to experience his "ancestral memories". Abstergo is seeking to discover the location of several artifacts, or the "Pieces of Eden", that hold great power, to control mankind and alter its fate, bringing humanity into one single unified group. Desmond also encounters a small team of modern-day Assassins; agreeing to work with them, Desmond uses their version of the Animus (the Animus 2.0) to continue to experience the memories of his ancestors to discover the locations of additional Pieces of Eden so they can be recovered before Abstergo can do so. While experiencing these memories, some of their abilities are genetically leaked into Desmond, known as the Bleeding Effect, giving him some of the Assassin skills of his predecessors at the cost of living with multiple sets of memories and personalities in his mind.